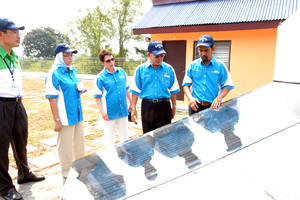 BANGI, 20 Oct 2010 – UKM’s Ultra Low Energy House is an innovative development and could become a test bed to see the successful application of local research projects. He said this when opening the Ultra Low Energy House and later surveyed the Green Technology Innovation Park built by the UKM’s Solar Energy Research Institute (SERI) opposite UKM Sports Field in the campus yesterday. 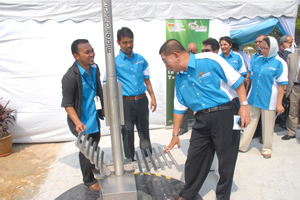 Dr Ongkili said green technology has been identified to further spur the country’s economic development with the government allocating RM210 million for research in renewable energy, green chemicals, water technology, nano green technology, environmental technology and industries in order to maximise human resources management. One of the green technology given preference is ‘Green Building’ incorporating energy saving techniques to cut the use of conventional energy. He later witnessed the signing of an MOU (Memorandum of Understanding) between UKM and the Commission on Science and Technology For Sustainable Development In The South, Pakistan (COMSATS) to promote and implement green technology. The MOU to spur scientific co-operation in renewable energy was signed by UKM Vice Chancellor, Prof. Tan Sri Dato’ Dr Sharifah Hapsah Syed Hasan Shahabudin and COMSATS Executive Director, Dr Imtinan Elahi Qureshi. It was witnessed by Dr Ongkili. Prof Sharifah Hapsah said the park is testimony to UKM’s commitment towards green technology and hoped its development will be supported by the government, industry and the private sector. 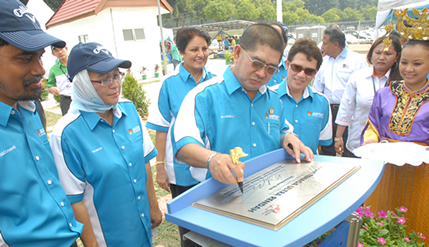 “We also hope the park will be a referral centre for green technology development in Malaysia in the future,” she said. The function was another milestone for UKM especially in promoting the nation’s technology agenda, she said congratulating SERI for the event which showed the success and achievements of its researchers. SERI has already developed more than 30 green products and is the only institute in the country offering MSc and PhD programmes in renewable energy. Prof Sharifah Hapsah said green technology is the application of environmental science in the preservation and conservation of the country’s natural resources to combat negative impacts of man’s activities. “Green technology is eco-friendly and is the prime mover towards a carbon-free emission to the environment. Green technology is also seen as a mindset change for a greener environment. Its approach is to return what man have taken from the earth,” she said. 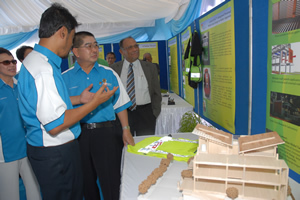 Research and development on green technology had been carried out by researchers at UKM covering low energy architecture, green building designs and green constructions, development of PV and building integrated PV, hybrid PV systems, wind turbine aerofoil design, solar homes, solar assisted cooling to replace conventional CFCs base air-conditioning system and several other projects. Dr Imtinan expressed confidence the MOU can help to bind relationship between the two institutions of higher learning. He will be bringing back the research and technological projects of UKM to Pakistan and hoped more could be done in the future. COMSATS, he said, had established 16 centre of excellence to promote South South co-operation and hoped Malaysia would become a member.